PHYSIC GARDEN BOOK (title tbc): I'm currently co-authoring a ground-breaking book on physic gardens with Professor Elaine Perry, for Green Books. Prof Perry, famed neurochemical pathologist, owns beautiful Dilston Physic Garden, where I'm Writer in Residence. 2017-18: 'Celebrating Age'; I'm part of a major funded project in rural Yorkshire run by Yorkshire Rural Arts, working with older people. Details to be confirmed! I performed at several festivals and events in 2016, such as StAnza and Ledbury, see here. my latest poetry collection from Red Squirrel Press. Many prize-winning & commissioned poems are included, many have featured in major anthologies and exhibitions. Pathology, politics and people feature in this, my 13th book, 4th full collection of poetry. Contact me for your event, library or festival for poetry or crime fiction. CRIME: THE STARLINGS & OTHER STORIES. My crime short story 'Mountains out of Molehills' features in a major new anthology, out now, alongside Ann Cleeves (ed), Martin Edwards, Cath Staincliffe and others of 'Murder Squad & Accomplices'. From Welsh publisher Graffeg, the stories were inspired by superb b&w photographs of Wales by David Wilson. 'Coffee table crime', a beautiful book and a great gift idea. PLAY PRODUCTION: my play THE MAN AND THE DONKEY at Customs House Theatre South Shields marked the centenary of Gallipolli. Details of the play, about John Simpson Kirkpatrick, here. 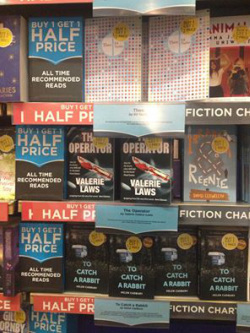 THE OPERATOR in WHSmith (Travel)! My 2nd crime thriller THE OPERATOR (Bruce and Bennett Crime Thriller 2, from Red Squirrel Crime) sold in WH Smith (Travel), and had a total reprint within three weeks of launching. Endorsed by Ann Cleeves, Alex Marwood, Phoef Sutton and Chris Longmuir, the book has its own page here. It's quite a coup for a book from a smaller independent press to make it into Smiths so I'm delighted, also to have photos of it in the chart at Aberdeen (photo on home page), & an 'All-time recommended read' in Newcastle (left), Kings Cross London, and in airports and stations all over the country. POETRY NEWS: HIPPOCRATES AWARD PRIZE: I'm proud to have won 2nd Prize for the prestigious £5000 Hippocrates Award (NHS). My poem was featured on BBC Radio 4's World at One, you can hear the clip HERE. MY INSTALLATION 'SLICING THE BRAIN' was shown at ZKM | Center for Art and Media in Karlsruhe, Germany, as part of the SCRIPT FILMS: Script as Image in Movement exhibition, part of an multinational project. It is also being presented in the International Goethe-Institute. It's been exhibited in full size glory in London, Newcastle, Berlin, Swansea, and now Karlsruhe. For more info and youtube link, see 'Sci-Art Poetry Installations' page. Link to ZKM page here. Where will it go next? !